Take a look at the photos below and email us your thoughts…..we will post them here on this page. The above photograph is of the mystery bird, and is copyrighted by Steve Wood. If you would like to use it, then please contact me first. Reproduction in any form without consent is not permitted. 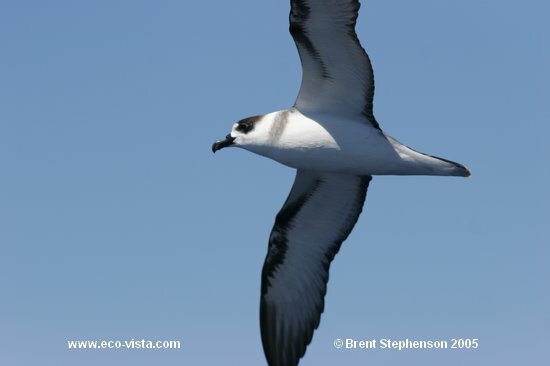 The image of the white-naped petrel above was taken off Tolaga Bay during a pelagic in Feb 2005. The above and below shots of black-winged petrel were taken during November 2004 near the Kermadecs. Tony Pym – This photo has niggled me all along, and I have looked back at it a number of times since it was first sent it to me. I have to say the nape, extent and brightness of white, is most intriguing. The bird looks like a Black-winged Petrel with a white nape. I understand that Vanuatu Petrel has been suggested, a species never described from the field and one I had not considered. I remember the paper by Mike Imber a few years back and have now read the article again. Vanuatu Petrel was (and still is, by some e.g. 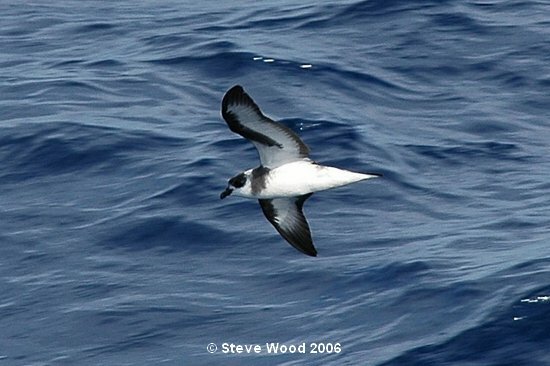 Brooke) considered a race of the White-necked Petrel. The paper describes specimens which were smaller, had greyer primaries on the underwing, and proportionately longer tails. What is throwing me with your bird is the underwing. Quoting the paper ”plumage of cervicalis (=White-necked) and the smaller birds (= Vanuatu Petrel) is similar….including….black diagonal mark on the underwing from the carpal joint”. 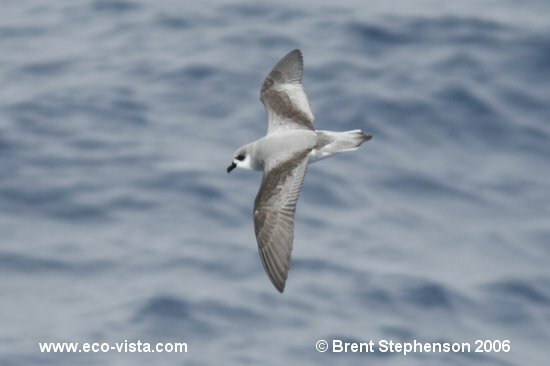 The bird photographed by Steve has so strong a carpal bar yet White-necked Petrel (by inference Vanuatu therefore) shows a much leaner black bar. 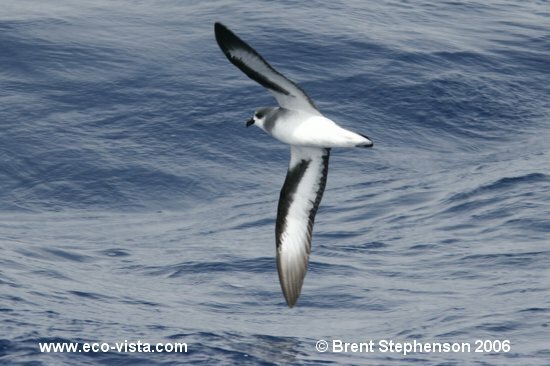 Yours has the width and intensity of Black-winged Petrel. Maybe there is variation in the bar on White-necked but I’ve not seen it in the field nor in photographs. I’m sure if Vanuatu does have an underwing bar anything like this, then Mike Imber would have said ‘underwing as Black-winged with nape white’ (= clear identification features) rather than the finer points of grey underprimaries etc? Also check out http://www.aviceda.org/abid/birdimages.php?action=birdspecies&fid=56&bid=686 – these are White-necked and none show such a marked carpal bar (nor extent of collar). If Vanuatu is a small White-necked, all these photos are relevant….. I heard that Victor Emanuel Nature Tours (VENT) had claimed a Vanuatu Petrel whilst on a cruise of the South Pacific last year. Drop an Email to Dion Hobcroft and see if he could comment on the underwing of the bird they had (and yours?) Was it as typical White-necked underwing or was it as pronounced as a Black-winged? The answer is on your doorstep, of course. Mike Imber wrote the definitive article on Vanuatu Petrel only a few years back…..if Mike says it is one, then that’s good enough for me!